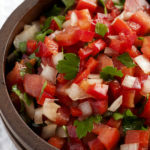 Pico de Gallo is fresh tomato salsa that is served with most Mexican dishes. It is a combination of fresh diced tomatoes, onions and hot peppers tossed together with lime juice and cilantro. Fresh Pico de Gallo being served with a corn tortilla chip. I could eat this fresh salsa every day! I not only eat it with corn tortilla chips as an appetizer, I put it on top of every Mexican dish that I make. There is just something about the blend of flavors that you get when making this recipe. The fresh garden vegetables are still firm and crunchy and are drizzled with tangy lime juice. 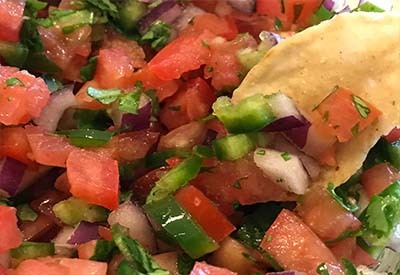 Add in a little cilantro and you have all the classic flavors of Pico de Gallo! 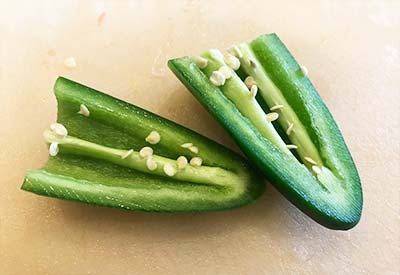 The heat in a jalapeno comes from the seeds and ribs. Remove for less heat. If you like things spicy, leave the ribs and seeds in the jalapeno peppers when dicing them up. However, if you just want a hint of flavor and not so much heat, discard both the seeds and ribs before adding them to the tomato mixture. I also prefer to take the seeds out of the tomatoes when making this recipe. Removing the seeds makes the dish easier to eat and prevents excessive moisture from sitting in the bottom of the bowl. It is best to use plum tomatoes such as Roma or Amish Paste tomato varieties for this recipe. These tomatoes have a thicker wall base and a tighter seed core as compared to traditional garden tomatoes. Because of the compact seed base it is easy to remove them. Just slice off the stem end of the tomato and squeeze out the seeds. 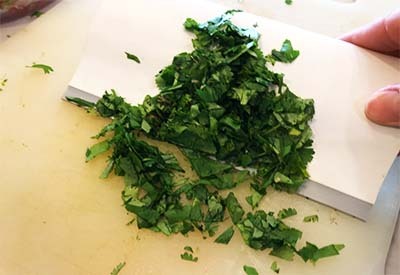 Then slice it in half and remove any stubborn seeds that are hanging on to the side of the walls. A BENCH SCRAPER makes picking up items off the cutting board a breeze! Once you have the Pico de Gallo prepared, wait at least one hour before eating it. It will be hard to wait, but the flavors will have time to meld together once refrigerated. Believe me, your taste buds will thank you! Classic Pico de Gallo recipe – irresistibly fresh Mexican salsa.